The fires of Echad Dunann glistened in the distance as scattered rays of lingering sunlight colored the clouds high above them. A short ways beyond the manned elf ruin more campfires illuminated a caravan of wagons, and the large, hardy goats that would pull them. Reigning in their mounts, Eruviel and Eirikr trotted the last hundred yards to the Stable-master. The elf maiden smiled kindly at them as they dismounted, taking their few possessions with them. Eruviel never questioned the capabilities of a horse that had been under her care. “Suilad, Rocherves,” Eruviel greeted the maiden with a faint bow as she handed her the reigns. 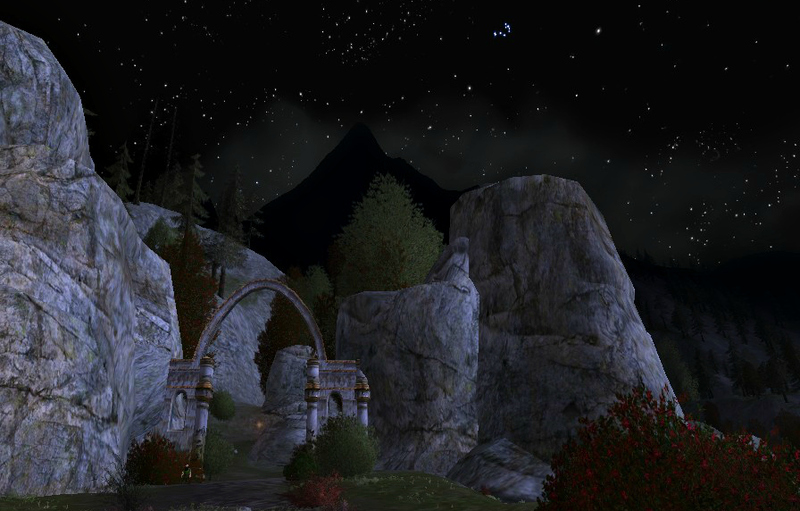 “They were, thank you,” said Eirikr, his gaze lingering on the towering peaks that looked down upon them. He stretched up to his full height and Eruviel bit back an amused chuckle, wondering just how sore her traveling companion was. “Very well,” Eruviel nodded. “When does the caravan depart?” Her question seemed to coax Eirikr from his thoughts and he looked up to glance between her and the Stable-master. “That is understandable. We should catch our rest while we can,” said Eruviel as she fixed her satchel over her shoulder. “You should be able to find Brogur at the front fire. Be well, and safe travels to you,” said Rocherves before turning her attention once again to the horses. Exchanging curt nods with Eirikr, the two of them set out to walk the short distance between the two camps. Speaking with Brogur they were shown to a lone merchant three wagons back that they would be traveling with. The portly dwarf named Norlin was hospitable and Eruviel could not hold back an amused smirk as he took an instant liking to Eirikr. In spite of the sound of dwarvish laughter that relaxed her companions stern expression, a shadow remained. She entertained the thoughts that it might be the caverns that awaited them, the slower pace they would be traveling at, or the foul creatures that still lurked in the twists and turns of Moria that weighed on Eirikr’s mind, but she knew otherwise.It weighed on her mind as well. Sitting by Norlin’s fire as he chatted away about the delights of being a traveling merchant, Eruviel only half listened. Her gaze drifted upwards to the ever-brightening stars above. She would miss them greatly. Though they would be in Moria no longer than a week, Eruviel doubted she would sleep the first few nights. The craftsmanship of the dwarves amazed her, and the company was good, but she never did care much for enclosed caves. A call rang through the wagon train an hour later as the merchants or their servants hitched the goats to the wagons. Looking behind, three more wagons pulled up at the rear. Just in time. The caravan moved forward at an almost practiced pace, climbing the gradual slope of the wide trail. The Gate-Stream to their right was as dry as the last time she had passed this way, though in some distant memory she recalled water once flowing over the Stair Falls. “When was the last time you were here?” asked Eirikr as they neared the top of their accent. “We will not be rushing at break-neck speeds for several days. I do hope you try to enjoy some of it.” She wanted to say that it would be a lovely thing to tell Ninim about, but she swallowed her words, unwilling to take the risk. An ache had begun to grow in her. A fear that they would arrive too late, or that something would go wrong. “I’ll try,” said Eirikr, chuckling slightly as they neared the Hollin Gates. Nodding ahead of them, Eruviel took joy at seeing the dwarven doorwards standing by the two lone trees that grew against the mountainside. Not since many years before her birth had there been doorwards at the West-gate. “Moria seems so much more grand when entering from this side,” she said quietly, a small smile curving up her mouth. Eirikr shot her a smirk but she merely pointed forward. The moon emerged just as the guards turned and spoke to the stone while the caravan was still yards away. The runes set by Celebrimbor in ages past glowed bright in the moonlight, illuminating the rocky shore, and the heavy gates opened.